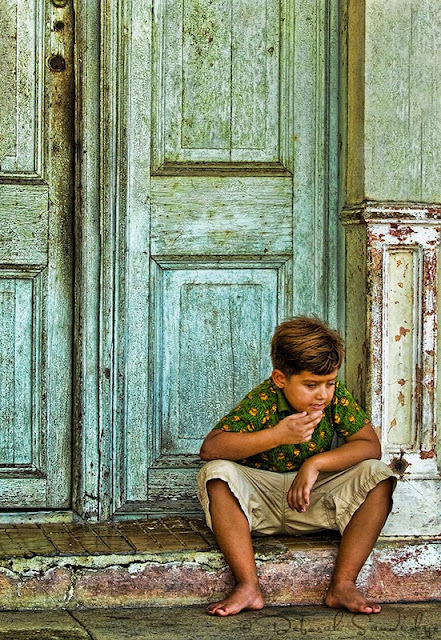 This little boy from Cienfuegos seemed to be concentrating on something important, like he had a lot on his mind. I liked being able to capture his expression without him noticing me. I hope he has it all figured out by now. Like the rest of us, there is always something important to ponder. Using a long lens with street type photography allows the photographer to go unnoticed sometimes. I didn't want to disturb his thoughts, or lose the moment with his pensive gaze. I like the opportunity to engage people I meet, but other times it's equally as nice to just observe and take photos quietly. Cuba is a wonderful country to visit. One of the most amazing things about it are all the textures and colors that surround you. There is personality in every corner, crack and crevice. The people are most friendly, and provide endless photographic opportunities.